We love our new the diningroom set. The set was delivered last night at 8:30 or so and we got it assembled before midnight. Everything was there and we're very happy to you and The German Collection store for shipping is to such a remote address from Florida! Picture attached for your use or to place on the store "Love Me" wall for impressing customers with how far you will go. Can you update me on when the 3rd chair might be available! Das Skyline Schlafzimmer ist endlich fachmännisch montiert! Es hat uns ein paar hundert Euro gekostet, aber das war es wert. Es ist sehr bequem und sieht sehr schön aus! Wenn ich den Raum dekoriert habe, mit Vorhängen, usw. Schicke ich einige Bilder. The chair arrived yesterday and it looks absolutely stunning. Thank you! We'll decide in the next week or so if we want to order the ottoman. Have a wonderful day. Vielen Dank für die viele Zeit und Mühe, die Sie in diesen Auftrag gesteckt haben. Wenn alles steht, werde ich Ihnen ein paar Bilder emailen; die Möbel werden in dem fast nagelneuen Haus sehr schön aussehen. We love it. I will send a picture of the rest of the kitchen so you see how well it makes our kitchen complete. Vento Sofa Bed - THE BEST! The vento sofa is great. The german engineering is outstanding, it easily seamlessly tramsforms into a bed. It a great bed for overnight visitors. We also have the figaro table that can easily be moved around, thanks to the wheels in the base. Love the brand. Love the quality. Love the design! Highest quality and great designs. I visited the store in Miami, FL in August of 2013 and was very pleased with its layout and the 'collection' presented there. The staff is very professional, knowledgeable and eager to help. The furniture products I've seen had highest quality and great designs. Good job! Great Quality, Great Price and Best Service ! We are Europeans who live in Washington D.C. We wanted to buy Franz Fertig sofas which are only made in Germany. We tried out the sofas while on vacation in Germany. I found this company from an internet search - never visited the showroom myself. Fertig headquarters in Germany verified that www.the-collection.us Florida (zip 33160) is an authorized dealer for them in US. We compared costs to those of buying in Germany and shipping to US – not easy to get the VAT tax reduction. The Florida based company was only a few hundred euro more expensive than buying in Germany and shipping ourselves – but they cut a lot of red tape hassle for you! Xenia at The Collection German Furniture was professional, responsive and very helpful – even sending swatches so we could truly verify the colour match before ordering and putting down the deposit - all done by email and phone. They arranged for delivery from Miami to Washington D.C. by truck - even took away packaging material. The sofas arrived six weeks after we ordered - in perfect condition and to specifications! Highly recommend the company’s customer service. November 24, 2013. I was looking for a high quality sofa bed and my search ended up to this shop which appears to be the sole distributor in the US for this certain manufacturer. Xenia was quick to respond and provided me with sufficient amount of information. It was difficult for me to make a purchase decision because I couldn't see or touch the actual product but she alleviated my concern by sending many photos upon my requests. 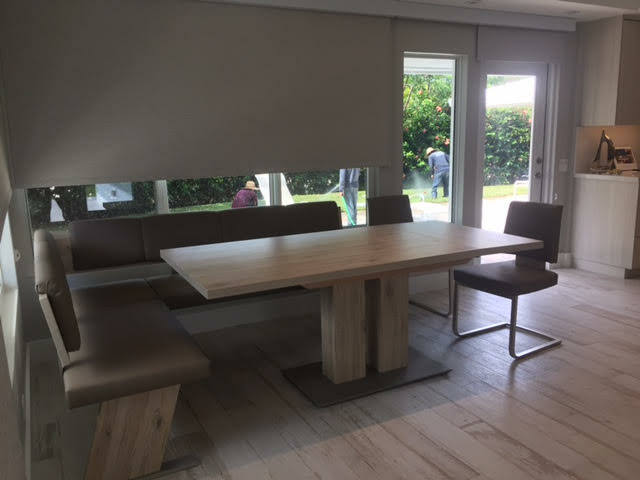 I am a designer who bought a table and chairs for my clients, not only I had an excellent customer service, but also and excellent follow up for the merchandise. This company looked forward the clients satisfaction at all terms. The products which this company provides are excellent in quality and results. I would like to recommend them to my future clients. The furniture purchased from The Collection was absolutely top of the line! Laura was wonderful and answered all of our questions.